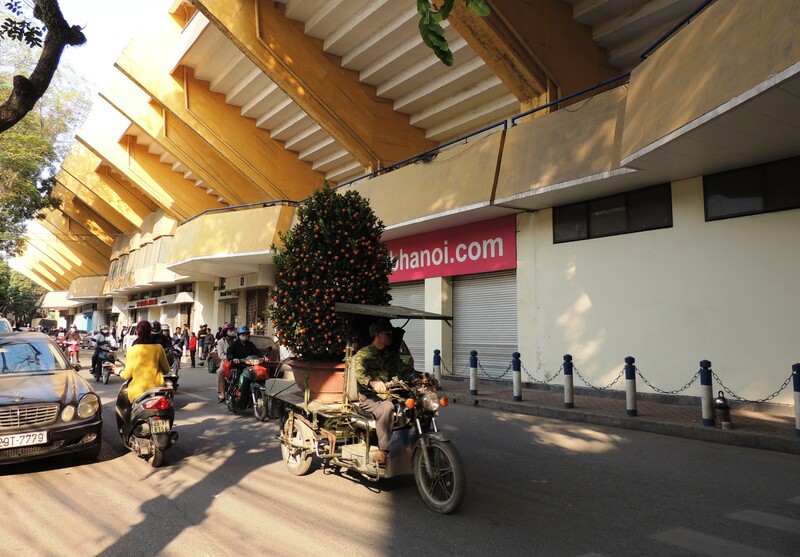 Just 18 days after the two teams met in the 2014 V League Super Cup, Ha Noi T&T would again be facing off with Ninh Bình, this time in round three of the league. Ninh Bình secured the super cup after a penalty shoot out and would again prove to be a thorn in T&T’s side. Again I was bewildered with the scheduling. The game kicked off at the ridiculous time of 4pm, on a Wednesday. Fortunately for me, I’d arranged an earlier meeting, which meant I’d be free by the time the teams entered the hang day stadium. I really don’t like to miss games, a bit obsessive? Yes! The streets around the ground were busy; not with fans who’d also managed to skive off work, but with traffic. Its ten days before Tet Holidays, Vietnams Lunar New Year Celebrations and the largest public holiday in calendar. The buildup results in a huge increase in traffic as people run errands, buy gifts and delivery guys flock to the city. Once inside I’d sat in my now usual seat, the back row of block 2, occupied by the younger real fans of T&T. But today there’s was plenty of space as many had stayed away. Other than the unusually high number of foreigners in the crowd (I counted 8, including myself) and the women with the ingenious fishing rod flag pole, there wasn’t much of interest in the buildup. It was rather subdued; the weather, for January, was beautiful though. T&T had looked strong so far, collecting 6 points from 2 matches.Ninh Bình had only secured 1 point from two. Surely a home banker. 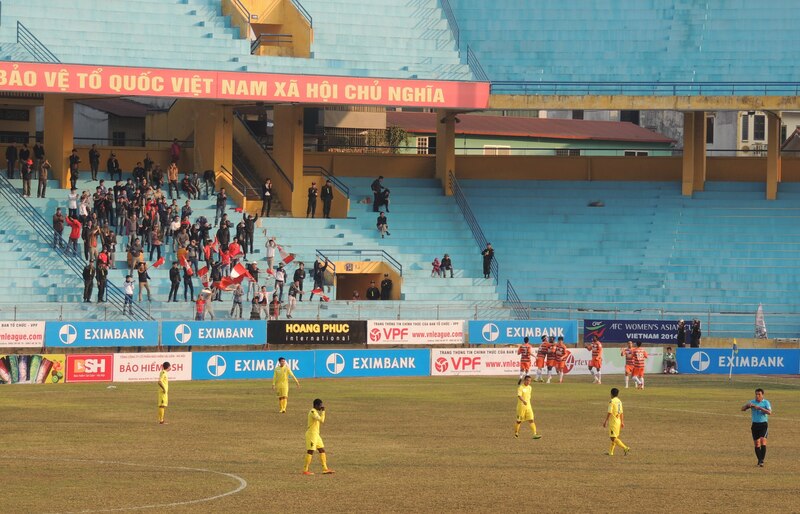 But Ninh Binh had impressed me with their attacking commitment and strength throughout, I figured it would be close. It was anything but close. Hà Nội T&T suffered a shocking opening 11 minutes. Some slack marking resulted in Ninh Binhs Patiyo Tambwe (4’) heading home unmarked at the far post (some reports credit it as a Gallagher OG, the ball was likely already over the line), while at the other end Ha Noi’s Argentine striker Gonzalo was off the field injured. He was soon replaced by Thanh Luong. Only a few more minutes had past when Jamaican Kavin Bryan latched on to a through ball and sublimely chipped the onrushing Hong Son. 0-2. With another 79 minutes to go! There was hope. Samson fired home for T&T just 4 minutes later. 2-1 down after just 15 minutes. The large number of foreign fans in attendance must have thought they’d stumbled across the most entertaining league known to man. The killer blow soon followed. 2-1 at H/T and Hà Nội T&T would have been confident but Patiyo Tambwe grabbed is second (34’). 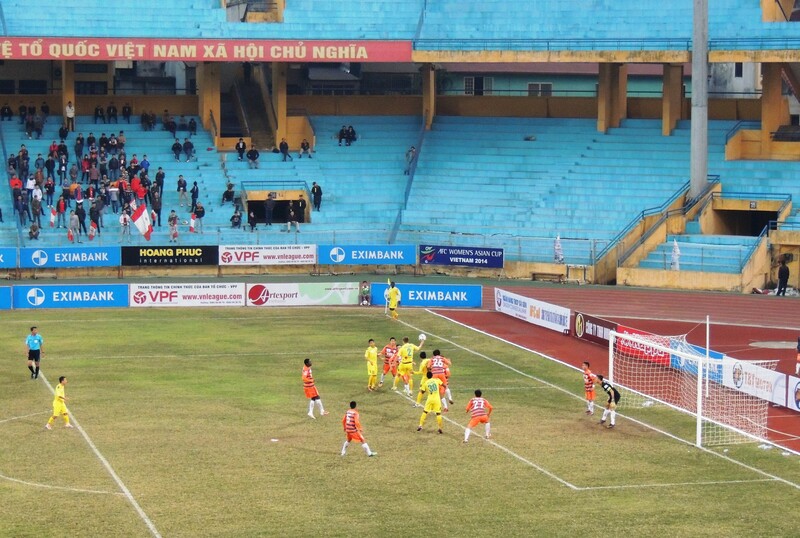 3-1 Ninh Binh. No more goals would be added in the second half. Hà Nội T&T pressed, via long balls (which seemed rather pointless when target man, Gonzalo, was injured on the bench) to no avail. Central defender Gallagher even moved to attack late on. Ninh Binh played well; compact in the middle, solid in defence and always a constant threat with the powerful Patiyo and Bryan, plus the impressive Dinh Van Ta. Towards the end Coach Pham Hung made an interesting substitution. Rather than send on an attacker, such as Bao Khanh, he preferred inexperienced centre half Duy Khanh. It seemed admitting to defeat while blooding another central defender. Will the coach make yet another defensive change ahead of the next game? The next game will certainly be tough, as Hà Nội T&T travel to India, taking on Pune FC. The Indian side are currently on a bit of a poor run and will see the visit of Hà Nội T&T as an opportunity to change their fortunes. As for T&T, if the team can tighten up in defence I’m confident with the powerful attack they can cause something of an upset on their Champions League debut. Here’s hoping.